This week not only marks the start of autumn, but it also marks Pollution Prevention Week. Pollution prevention is any practice that reduces, eliminates, or prevents pollution at its source. Source reduction allows for the greatest and quickest environmental improvements by avoiding the generation of waste and emissions. Take action this fall to do your part. Turn off the lights and use energy-saving light bulbs: Lighting accounts for approximately 12 percent of a household's annual electric bill. New energy-saving bulbs use 25 to 80 percent less energy than traditional incandescent bulbs. Replacing 15 traditional incandescent bulbs could save you about $50 per year. Reduce standby power: The electric power consumed by products when switched off or in a standby mode is called standby power. It accounts for 5 to 10 percent of residential energy use, costing up to $180 per year. Unplug or turn electronics off at a power strip to eliminate this wasted energy. Buy locally: Buying locally grown food supports the local economy, reduces emissions from refrigeration and transportation, and cuts back on packing materials. Buy Texas organic products that are produced without synthetic pesticides, herbicides, or fertilizers. Use less toxic cleaning products: Using less toxic cleaning products can reduce pollutants in both the air and water, and may help improve the air quality in your house. The EPA’s Safer Choice program labels products that can help protect the environment and are safer for families. Use less pesticides and fertilizers: Apply pesticides and fertilizers according to the label’s directions, and only use the recommended amount. Excessive watering or a rainstorm can wash away the chemical excess—wasting your money and endangering nearby waterways. Drive less: To reduce air emissions, take your lunch to the office, carpool, use public transit, or simply combine errands. Removing one properly maintained car from the road for one year saves an average of 17 pounds of nitrogen oxides from being discharged into the air. Take care of your tires: Over 3 million tires were sent to Texas landfills last year! Reduce the number of tires you use by taking care of the ones you have. Test your tire tread monthly. Insert a penny upside down. Your tread is too low when you can see the top of Lincoln’s head. 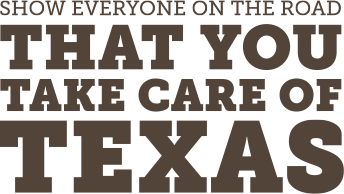 For more ways conserve water and energy, reduce waste, keep the air and water clean, and save money, visit TakeCareOfTexas.org. While you’re there, pledge to Take Care of Texas, and we’ll say thanks by mailing you a free Texas State Park Guide.